Another windy day. This quick sketch was a lesson in simplifying the subject matter… Capture the mood! Barbara graduated from the University of Texas with a degree in Biology in 1975 and promptly began raising a family while pursuing a career in art. She taught art for twelve years at Baton Rouge Lutheran School, and was involved with youth as a leader in Boy Scouts and Girl Scouts for seventeen years. After arriving in the Hill Country in 2005, she began to teach private art classes for children. Her interest in art has always been a part of the fabric of her life, and she began painting fine art in earnest. Her art is mainly in oil, especially plein air paintings, and she also dabbles in church banner painting, wood burning, and mosaics. Give her an idea, and off she goes. 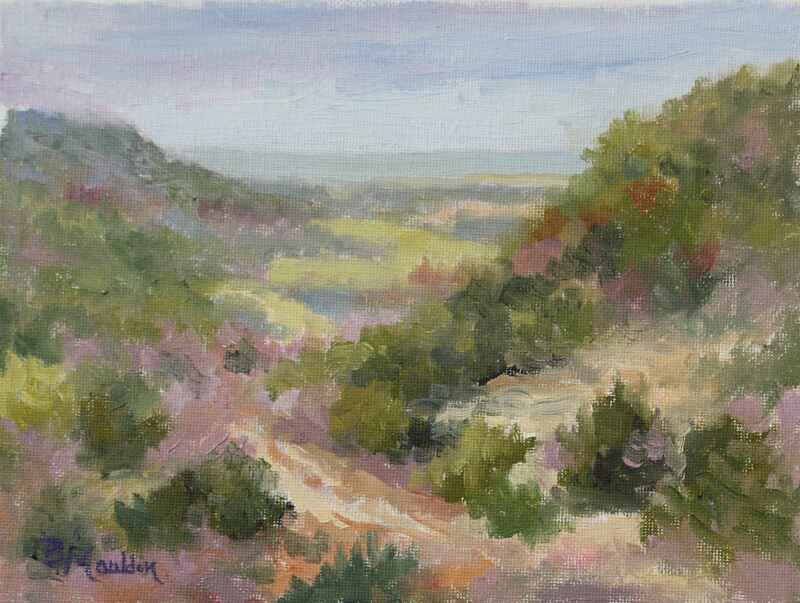 Although she enjoys all these endeavors, she prizes the time she spends with her husband and fellow artist Chuck Mauldin, painting the beautiful landscapes of the Texas Hill Country, as well as any area of the world where they are visiting. In addition to teaching children’s art classes in Fredericksburg, Barbara has taught art/creativity classes for adults at the Cancer Resource Center at the Hill Country Memorial Hospital. She has studied with Ian Roberts, Kevin Macpherson, Jill Carver, Lori Putnam, and (of course!) Chuck Mauldin. She participates in paint-outs with Plein Air Artists of Colorado, Oil Painters of America, and good friends here in the Fredericksburg area. She is active in Die Künstler von Fredericksburg (The Artists of Fredericksburg) – serving as show chairman in 2013 and currently as secretary. She has been accepted in the juried “Paint the Town” plein air event in Marble Falls as well as the “What I Love about Texas” Art Show sponsored by the Fredericksburg Art Guild. In 2010 she received the Artists’ Choice Award in the Annual Die Künstler Art Show. Her landscapes have been accepted into the Plein Air Artists Colorado National Juried Art Exhibition in 2013, 2015, and 2016. She has exhibited in the juried 2015 Mountain Oyster Art Show in Tucson, Arizona and the 2016 Cowboy Reunion Fine Art Show. Barbara is an associate member of Oil Painters of America and an associate member of Women Artists of the West. Her paintings are characterized by color. “I like to emphasize the color that I see, as a creative and emotional response to the landscape.” She experiments with limited palettes, using a small number of pigments to mix colors, which results in beautiful color harmony. Barbara has focused her attention on the Texas landscape. 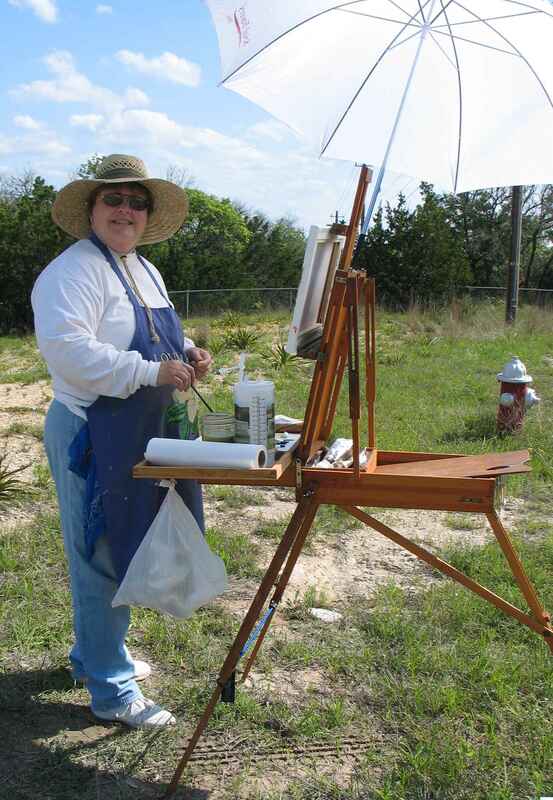 She enjoys plein air work, accepting the challenges of color, design, and the environment (critters and weather). It is especially challenging to find a painting in the stark days of winter or drought, when the landscape has gone to sleep. However, Texas abounds with variety and inspiration; there is always another painting just around the corner! Barbara and Chuck have three children and eight grandchildren, and art has always been and continues to be a family experience. All items remain property of RS Hanna Gallery until paid in full.